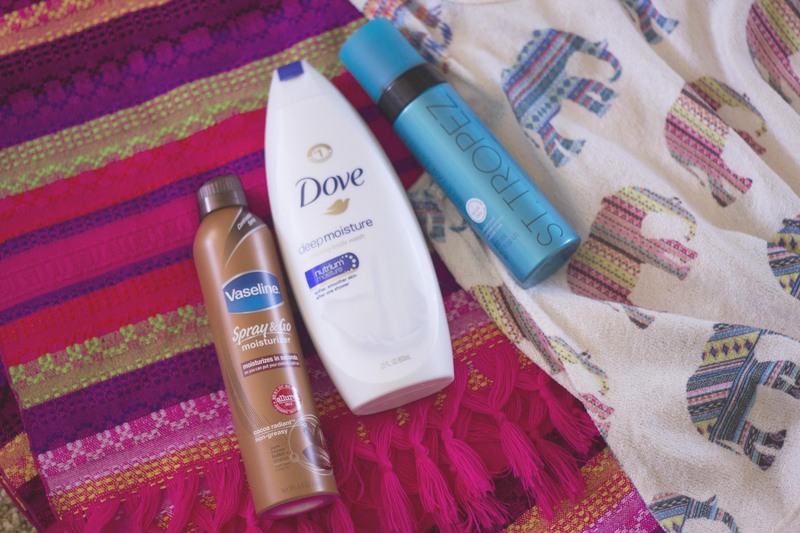 It’s already August but I’m not ready to let go of summer–or the healthy glow of a summer tan! Whenever I’m outdoors I’m wearing SPF 50+ (even at the pool!) so I get my tan from a bottle–no premature skin aging for me, thank you! Self tanning can be tricky–from orange legs to streaky zebra stripes–so I’ve gathered up all of my favorite tips and tricks I use to have a blended application for a tan worthy of a Caribbean vacation! My skin soaks up self tanner better if I’ve been extra generous with moisturizer the week prior to tanning. If you skin is dry, it’s a bit harder to blend out any streaks. I’ve been using Vaseline’s Spray & Go moisturizer from my local CVS, giving myself a few spritzes from head to toe. I prefer to apply moisturizer in the evening after a shower so it has all night to work into my skin. The day before I’m applying self tan or touching it up, I’ll spend some extra time in the shower prepping my skin. It’s important to slough off dry skin cells and get a good exfoliation in. I like to use a creamy Dove bodywash (also from CVS!) that is cleansing and super moisture rich at the same time. 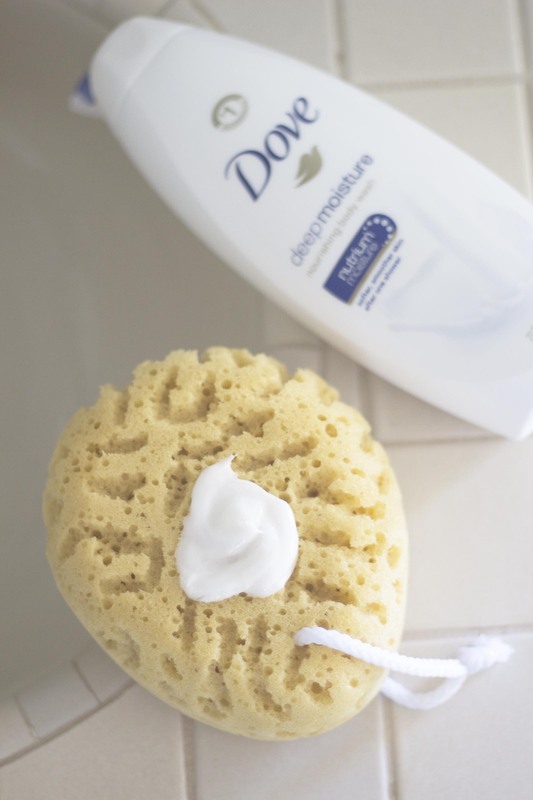 I squeeze a big dollop into my amazing natural sponge loofah and squeeze squeeze squeeze to get giant bubbles. Don’t forget to shave as needed–you won’t want to shave over freshly self tanned skin! I used to rub in my self tanning lotion and really work it into my skin but I found that it would result in a streaky tan. I switched to this St. Tropez tanning form and use soft, sweeping motions to spread the foam into my skin. At first it can look stripe-y but it’s just like applying eye makeup–keep on blending blending blending and it comes out perfect! When it doubt, keep blending! 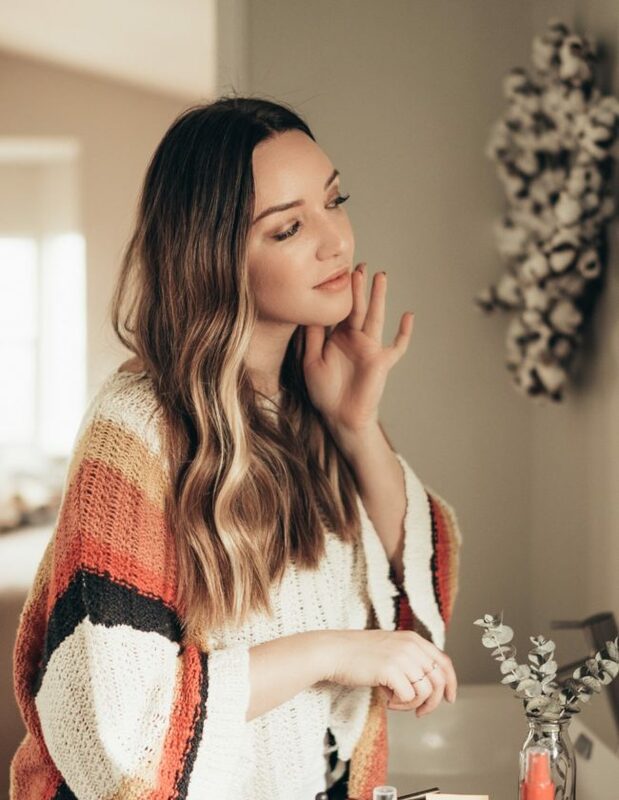 Be sure to moisturize elbows, hands, knees, and feet prior to applying tanner–these areas soak up color more densely and need a protective moisture barrier to achieve the right amount of tan! Once I’ve left my self tanner on for the allotted duration ( I do 2 hours for a medium tan!) I follow up with my same daily moisturizing routine to help my skin hold the color for a bit longer than a week. I mentioned in my previous posts that I am following along with the CVS Love Your Skin videos–it’s a series of videos featuring Yale School of Medicine’s Dr. Mona Gohara where she covers a range of topics including why skin heath is important, keeping your skin healthy head to toe, and safe sunless tanning. I’m checking back this week to hear her tips on a golden summer tan, without risking your health! (Bonus–discount coupon here!). This post created in collaboration with Lunchbox. All opinions are my own–skin health is important!